Midwest Timber is located in Edwardsburg, Michigan. Our 35+ acre facility sits on the Canadian National mainline and is ten Miles away from the Indiana I-80/90 Toll Road. We are very close to other major highways in the area, including I-94 and US Route 31. Our location allows us to serve the Illinois, Indiana, Michigan, and Ohio markets effectively. Midwest Timber produces treated lumber using three double door treating cylinders. We also produce kiln dried after treatment material using our four dry kilns. 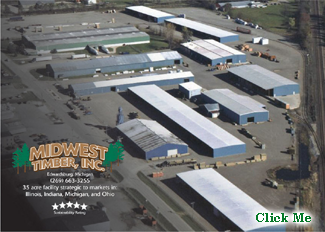 Midwest Timber's facility also includes 200,000 square feet of inside storage space. This allows us to keep a majority of our material under cover. We unload railcars on our flat car siding, which has a 20 car capacity, as well as our covered box car siding, which has a six car capacity. Over two thirds of our site is paved with asphalt, while the remainder is covered with stone.